Helpful Tips for Entrepreneurs and Small Businesses. It’s that time of year again. Merry music, hot chocolate, and mittens may be appearing before your eyes. You guessed it: the holiday season is upon us. With this annual event comes the biggest, and often the best, problem that many small businesses face: too much business. While the holiday season can be a double-edged sword, it presents an opportunistic time for a small business. Typically, this time of year signifies employee turnover, expanding store hours, and longer employee shifts, but there’s a way to overcome these hurdles and deliver a strong sales-focused end to the year. 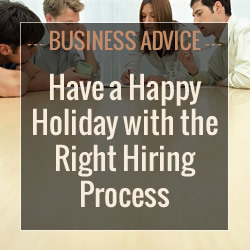 The answer is simple: to turn this busy time of year into the most profitable and manageable, give yourself the gift of better hiring practices. Treat employees like the resource they are. Current employees can quickly spread the word that you’re hiring. Empower them to do so with social sharing. Posts to Facebook, Twitter, and even professional networking sites can help them carry your hiring messages to the right people. Better yet, you may find your employees turning into brand ambassadors: individuals excited to tell people about your business and what you stand for… all while getting the seasonal staff you need. Work better. Forget the days of resume-flooded inboxes and enter the world of automation and applicant tracking! Recruiting tools offer a streamlined and user-friendly way to collect resumes and keep track of interactions with candidates all in one place. Most importantly, carry your new process into the New Year and make a resolution to stick with it, bringing the success of the season with you into 2014. Put your eggs in one basket. Build a database of candidates to keep in your pipeline as jobs open up. Even if a candidate isn’t hired this year, they could be perfect for a future initiative. Make sure to maintain a pool of talent to tap into when it comes time to expand, and keep this list as tidy as you keep your holiday wish list! Let multiple hands reach into the cookie jar. Recruiting and hiring both require a lot of effort, and it’s often more than one person can handle. With the help of recruiting tools and a few of your trusted employees, you can better manage the process with notes and setting up applicant staging while creating a more efficient hiring process. These tips can help you avoid getting your tinsel in a tangle when you start hiring your holiday staff. Managing the process will make the snowstorm feel like a flurry and your profits feel like presents! Raj Sheth is the co-founder of Recruiterbox, an online recruitment software and applicant tracking system designed especially for growing companies. 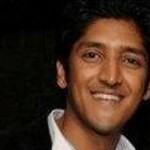 Prior to Recruiterbox, he founded two other web startups -- a classifieds portal and an ecommerce site. He is a graduate of Babson College and spent the first three years of his career as a financial analyst with EMC Corporation in Boston. Visit his website at recruiterbox.com. Listen to Customers – You Need Them!